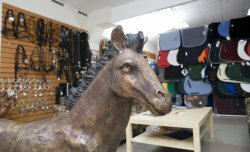 New Century has its own horse boutique, here you can find all what you need for pleasant dressage experience. We have variety of best horse riding labels, all goods are best quality this touch of style & fashion. Good emotions guaranteed.